Gourmet Chocolate Dipped Pretzels is rated 4.7 out of 5 by 18. Rated 5 out of 5 by Pippy from Delicious product I bought these for my grandson for Christmas, and he loved them, and they arrived ion time. Rated 5 out of 5 by Abuadamin from Fantastic I bought these pretzels a week ago, & I loved these pretzels!!! Rated 5 out of 5 by Vixen97 from Better than Sherries Berries! My brother loved them! Beautiful presentation. Great gift idea. Rated 5 out of 5 by Robertfgddguyf from Pretzels They sure do look nice in the picture. I sent several as gifts. Nobody acknowledged receiving them. Maybe next year I will forget to send gifts. Rated 5 out of 5 by Jules7492 from Very Nice! This was purchased and delivered as a gift, so I never did see the finished product. However, the rave reviews I received from the individuals who received the gift spoke volumes! 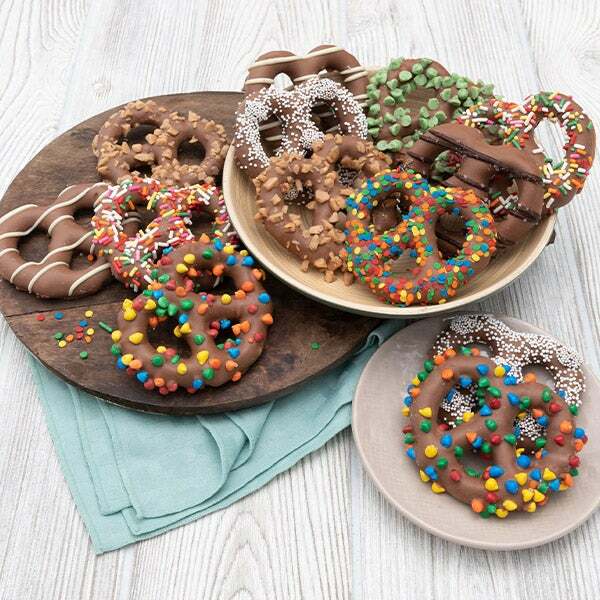 Rated 5 out of 5 by EvyM from Delicious Gourmet Chocolate Dipped Pretzels Purchased this product and was extremely happy with this product presentation. Definitely would reccomend this as an excellent hostess gift . The pairing of sweet and savory tastes, these thick, plump pretzel rods are dipped by hand into rich, imported Belgian chocolates and transformed into masterpieces with premium nuts, festive candies, and a silken chocolate drizzle.